Today I am back linking up with my second Mood Board Monday party with Sarah at Pewter+Sage. The blog party is all about seeing how different people are inspired differently by the same thing. The challenge was to choose from one of three gorgeous chairs and design a room around the chair of your choosing! I have had an home office space in my mind lately. My husband loves to travel and would love to visit Africa again soon. I thought it would be fun to design a "Safari Country Club" home office for my husband around the "Cecilia Chair" from Horchow. 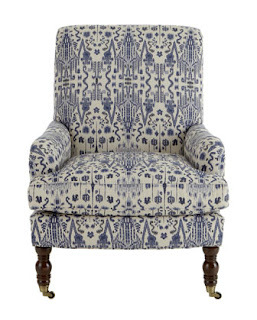 This chair has a tribal-feeling print that worked great my Safari Country Club Home Office. For this board, I set out to create a space that felt masculine with the world-traveler feel using rustic elements and lots of texture. I chose a deep,blackened navy for the wall color and lightened the space with a natural jute rug layered with a white cowhide rug. I also envisioned floor to ceiling, clean lined built-ins painted a white color to help lighten the moody blue on the remaining walls. A fun play on African wildlife with a modern Rhino head and a collection of vintage globes finish off the "Safari Country Club" home office. The star of the room is the pair of Cecilia Chairs sitting in front of the desk. This allows for the occasional client meeting or a comfy place for the wife to drop in and say hello. The windows would be covered in Coronado White Sand, Bali Grass Blinds like these used by Caitlin Creer. This light colored and textured window treatment adds privacy but still allows light to flow in while remaining masculine. The artwork- Seaweed by Michelle Armas- ties together all the colors of the room in a modern abstract piece. Z-Gallerie's Rhino Head will pop off the dark walls and make the African statement needed for this safari themed room. The Metal Accordion Side Table gives the client a place to set their drink and will sit between the two chairs. A collection of vintage globes are always fun to see and could be lined up or staggered throughout the built-ins which would be painted Benjamin Moore's Stone White. The wall color is also a Benjamin Moore color- Marine Blue. The Hendrix Desk from Crate & Barrel has a handmade, rustic quality that gives that masculine, laid-back African vibe to the office. The Barrel Back Desk Chair by Edward Wormley is a show stopper (and wallet buster). The olive green leather and dark walnut combine for a masculine desk chair that even this wife would love to have!! To lighten up the space, I have layered this Chunky Wool and Natural Jute rug from Pottery Barn and the Serendipity Devour Cowhide White Rug from RugsUSA. The Beaded Basket Lantern in Gray and Aged Silver from Shades of Light adds the perfect amount of masculine glamor to the space. Overall, I feel like this is a space that both my husband and I would both enjoy! 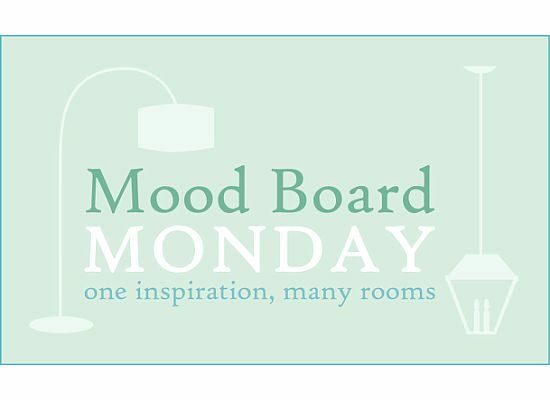 Make sure you hop over to Sarah's blog and check out the other mood boards. They are all gorgeous! Laura, this is fabulous! Love Michelle Armas piece and it does a beautiful job knitting the space together. The desk and chair are stunners too, love it all! Wow, this space is gorgeous! I absolutely love the dark, moody wall color with that great artwork and desk. And, that green chair?! OMG! AMAZING! Love it. Feels traveled and collected, my favorite. That office chair is killer! Laura, this space is fantastic! It reminds me of a modern take on a Hemingway inspired office. I think my favorite elements (hard to pick) are the abstract artwork and the green desk chair. How cool! I love that you took a personal spin on your board too along with a few others. What a great way to start thinking about your own home. And you've incorporated so many different textures which I think is also important to a room. And it is definitely both masculine and feminine - a perfect mix. Hey, Laura! (Sorry I'm late!) I'm so glad you are back for another MBM party. My jaw is like dropping, this room is amazing!!! This blue and white chair in a "safari country club" office?! I mean, my brain is going to explode, its like so cool!! I am so excited that this whole inspiration thing is actually working - like people are choosing the same piece and taking them in wildly different directions, and they all work! We are awesome!!! My favorite thing about this room is simply the vibe. And I love the paint color, the vintage globes, the chandelier. And that green leather desk chair...hello!!! So handsome. The artwork ties the whole palette together so well. You really pulled this off, hats off to you!! I love the inspiration chair you chose and how you pulled together the masculine look of your office design. It is very chic and a little modern too. The green desk chair is fabulous. Love it!